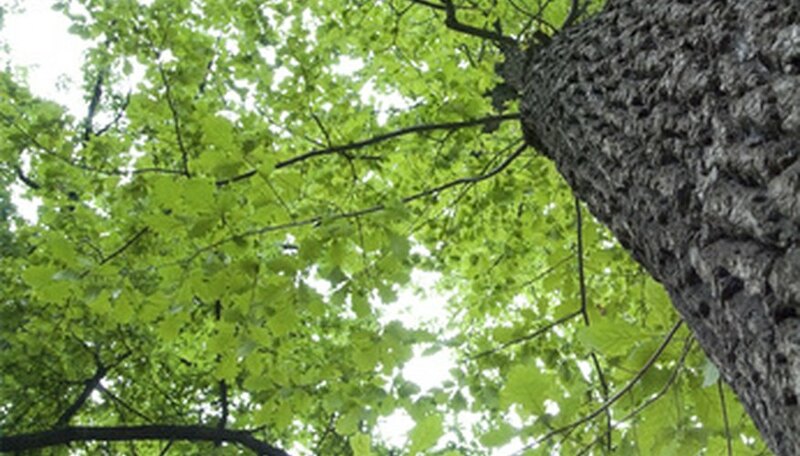 There are 13 species of oak trees in Florida, according to the Florida Department of Agriculture and Consumer Services. Of those, six are found in the southern portion of the state: the bluejack oak, chinquapin oak, live oak, swamp laurel oak, turkey oak and willow oak. Each variety has a distinct size, leaf and acorn. Examine the leaf size and shape. Look for shape and size of lobes, broadness of the leaf, texture and color. Bluejacks, swamp laurels and live oaks have long, slender, smooth-edged leaves that lack lobes and are between 5 and 6 inches long. Chinquanpin oaks have slightly larger leaves with ridged edges. Turkey oaks have leaves that are somewhat shorter than the other varieties and have three to seven lobes. Willow oaks have slender leaves, resembling those of the tree's namesake. They are much smaller than the leaves of other varieties, usually between 2 and 5 inches long. Examine and measure the acorns. Although the bluejack, swamp laurel and live oak varieties have similar leaves, their acorns are very different. The acorns of the bluejack oak are half an inch long and have vertical dark bands around them. The swamp laurel oak's acorns are a similar size but are dark brown and have shorter caps. The live oak's acorns are twice as long, often about an inch in length. Turkey oak and willow oak acorns are quite similar; both are light brown and have reddish caps, but the turkey oak acorn is an inch long, which is twice the size of the willow oak acorn. Finally, the chinquanpin oak's acorns are a half to an inch long and are light to dark brown in color. Estimate the height and spread of the tree. Oak trees are widely varied in size and shape. Bluejacks rarely exceed 20 feet, whereas the swamp laurel oak can reach to 100 feet or more. The live oak reaches between 60 and 80 feet in height, but it often has a spread of more than 100 feet. The chinquapin reaches a similar height but is round-topped and does not spread its shade nearly as far. Turkey oaks and willow oaks are usually between 20 and 30 feet tall but can sometimes reach to twice that height.